Spectrum is a unique indicator identifying potential market reversal points based on digital analysis methods. The indicator uses the latest digital method of fast and qualitative selection of the market spectrum. Resulting frequency components are pre-processed in order to determine existing market cycles and then create a signal trading system. 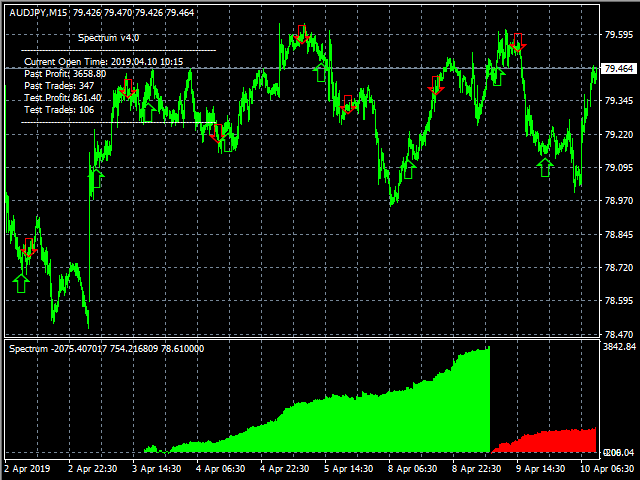 MethodVisualization - calculation method and equity chart representations: 0 - by bars; 1 - by trades. Trading period: any, recommended from M30 and higher. Улучшен алгоритм и упрощена настройка индикатора. Expanded and improved the option of optimization of internal parameters related to the indicator calculation procedures.